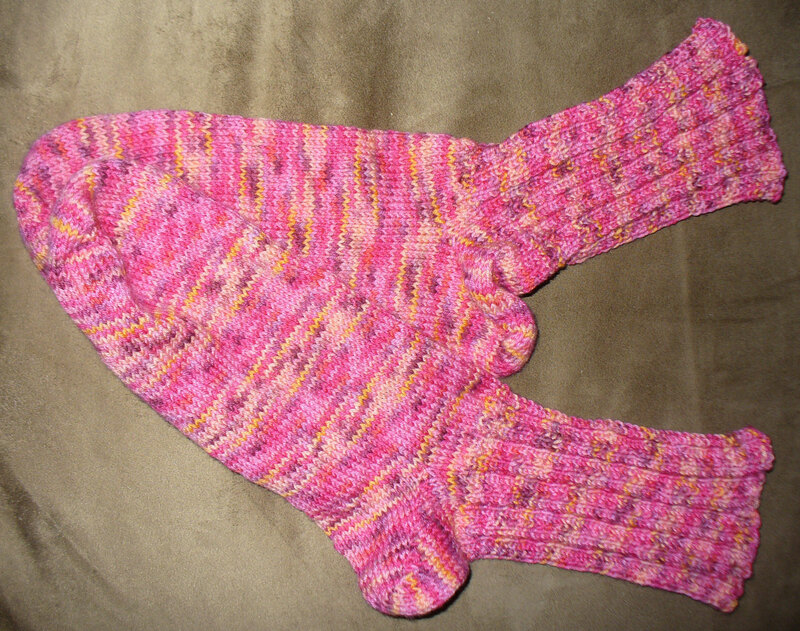 A simple pair of socks. They took forever to finish. They aren’t fancy or gorgeous. They are a simple mesh pattern in a utilitarian color. They are quite soft and squishy. They will be worn a lot this winter. It looks good even in artificial light! The button is where she wants it, and I think it will work. I love these two yarns together, and I am so glad my friend likes them, too. At least as far as work goes! Vacation was such a slow nice time, we did NOT MUCH after the pellets were stacked, it was hot and humid and we didn’t have to. We puttered and visited friends, we ate out every single day. There was no cooking on vacation. This is my work organization’s 50th anniversary, but we are a Community Action Agency, so we have like, you know, no money for fun stuff. Still, we wanted to celebrate with our partners and especially with our clients. And while we do an annual dinner, most times, clients and community members don’t attend. So we got this great idea (maybe in April?) to have community picnics or barbecues. We could load up the boss’s pick up truck, drive to different communities, set up, feed people, talk to people it would be great. The boss got some donations, and we were off. It sounded like a great idea then! But of course, nothing is that easy, and the two person committee (me and my coworker of knit-buying fame, B) had about a million unexpected big projects land on our desks. July schedule turned to August, and it got later. We finally said we had to do it or we could not be outdoors! So this week we did it, and they were GREAT. But it was, of course, WAY more work than we ever imagined. We did 5 in 5 days, starting last Friday, the fifth one was today. That’s it, we are done for another 50 years. It will take us that long to recover and forget how much work it was. We put together a great team, we cooked about a million hot dogs and hamburgers, we traveled all over the two counties. The picnics were an hour long, but some places, that meant an 8 hour day, once you added in the set up time and drive time. So it was a crazy week, and it ain’t over yet. Our third annual tennis tournament fundraiser is Saturday. I am almost ready for that, and will be by the time I leave Friday night. But it means a 6 day work week. Sigh. 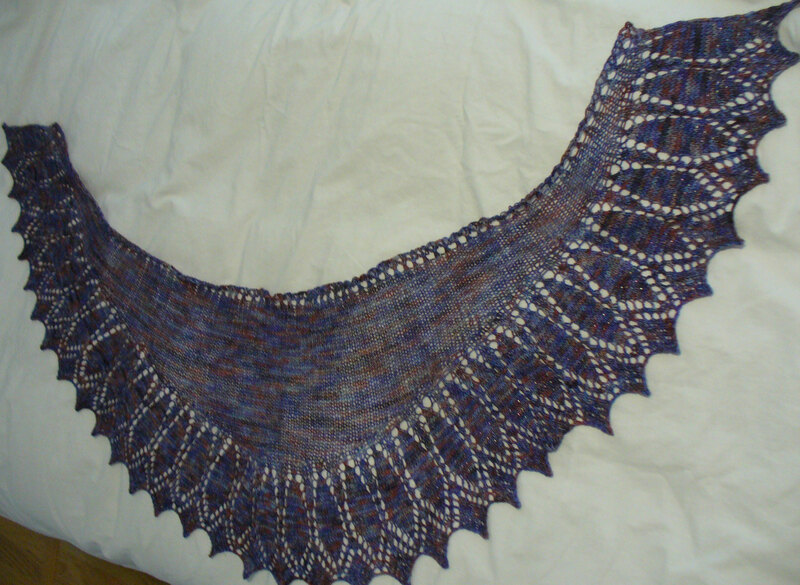 I finished the Oaklet shawl in Tern. In spite of my apparent inability to count, and having to order more yarn, it came out well, I think! I would do it again, but pay more attention to my counting, I think. I also finished one bobbin of the Life’s a Beach spin, and started the second one. And I keep knitting on the other three shawls, they are starting to show progress, I think. No new photos of them for you, though. I also listed lots of hats and things on Etsy that came back from the pop up shop. Mostly baby things but not all. Check it out here if you have a mind to. Nothing you haven’t seen before! I have a few new things in my brain. One of the girls who works for us during the school year brought in some “head wraps” she bought at the fair. They are lovely, knit from hand spun yarn, very cute on her. She wants me to make her some more. I looked and it looks pretty easy (famous last words) so I am going to work out a pattern to do that and make her a few of those. Other girls saw them and want them too, so I may be able to sell a pile of them! They are like cute hats with no top, not sure of the appeal, but I won’t argue. I will go and see if the person is selling the pattern, though. That would be easier, and would feel more ethical to me. Other things I am looking forward to – supper at Mom’s after the fundraiser on Saturday, and NOTHING planned for Sunday! Plus, I am taking next Friday off because of working so much this week. Next weekend is the Common Ground Fair, and I will be heading there with Mom and niece B (owner of the now healthy bunny) so they can look at animals and I can look at yarn and fiber. I can’t wait for that! Also, next Friday is the day I ship this %&*^#*&^&^ heart event monitor back to Tennessee. I can’t wait to get rid of it. I hope it is providing useful info to the MDs because it is driving me crazy and I would hate for that to be for naught. It did get me out of lots of hauling and lifting during these picnics, though! Here it comes – another rainy weekend! 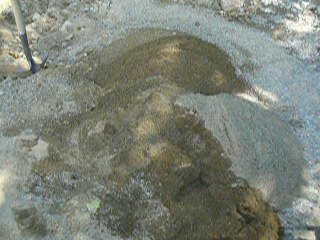 Drives me crazy, since I am close to the end of the excavation phase of the pool, and I can’t sift wet sand! Once that is done, I can work in the rain, but I have to get that done. 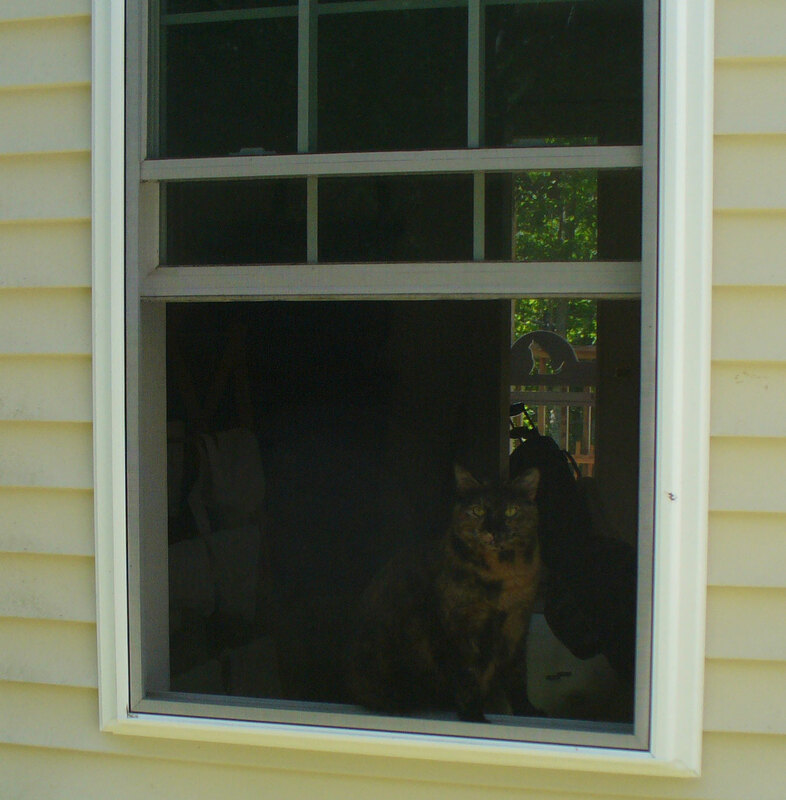 Today, we both had the day off – and I forgot to give you a Friday list! It had some new things on it, for sure. Followed that with a stop in Belfast for lunch and the fabric store. 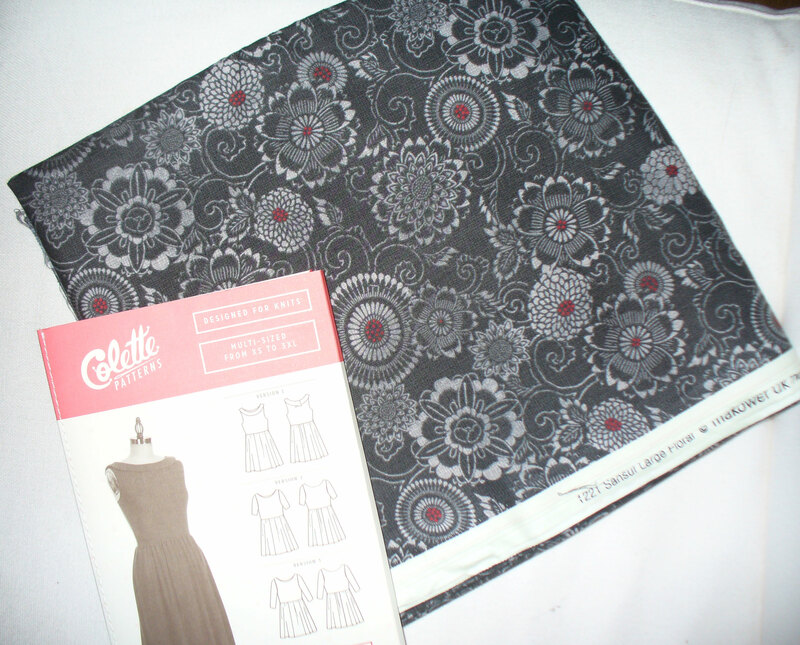 I was excited to see that they carry Colette patterns, I have been wanting to try them, but never had the nerve to get them online. I picked up one for a dress, and some fabric for a skirt. A was waiting in the car so I did not browse long. The pattern calls for knit fabric, and I didn’t see any there (but it is an amazing fabric store, very good quality material) so I will be on the hunt for some I like. I am excited to see that they are moving onto Main Street to a bigger place – more room for fabric and the other arts and crafts supplies they carry. No yarn, but there is a yarn store in Belfast already, so I can live with that. Then we stopped at the grocery store – went in on a sunny-ish day, came out to a torrential downpour that ushered in a rainy afternoon. 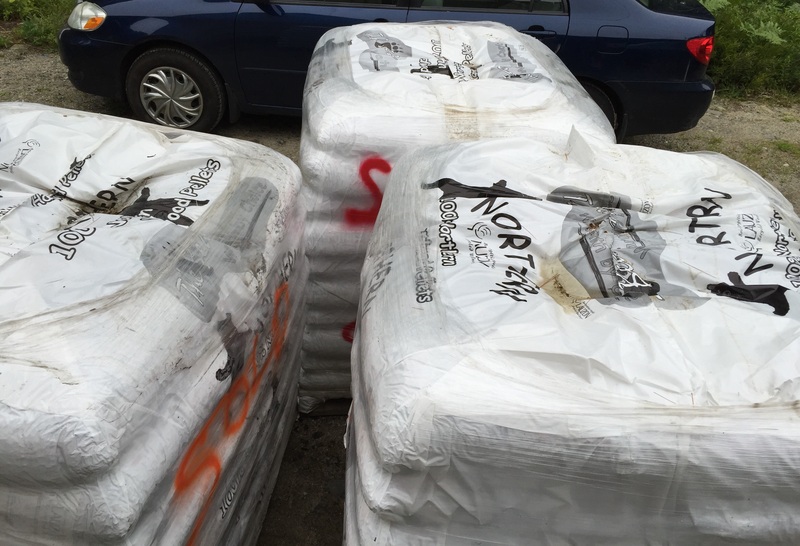 This afternoon we have worked to get a ton of pellets put in the cellar for the winter. Tomorrow, L comes over and we will put two more tons down there. We have a good system for it, but it is still a lot of work – fifty 40-pound bags in each ton have to be picked up, brought into the house, slid down our special ramp to someone catching them in the cellar, then onto a cart to be rolled over to the corner and stacked. It works well with at least three people. It is a huge chore with two, and I can’t even imagine doing it alone. I guess I wouldn’t, I would build a shed and have them delivered into the shed, then bring them in all winter long, a bag at a time. 🙂 Next month, we will get two more tons, plus a ton of bio bricks. That should get us through the winter, it is how much we burned last year (we have 5 bags left) and more than we ever burned prior to last year. Sunday, I think we have no plans. If it is dry enough, you know where I will be! With brief breaks from digging to shift the laundry, of course. Meanwhile, I cleaned off the camera, and thought I would share these few photos of a very belated high school graduation party we recently went to – A’s great-nephew is off to college in New Orleans in a month or so. 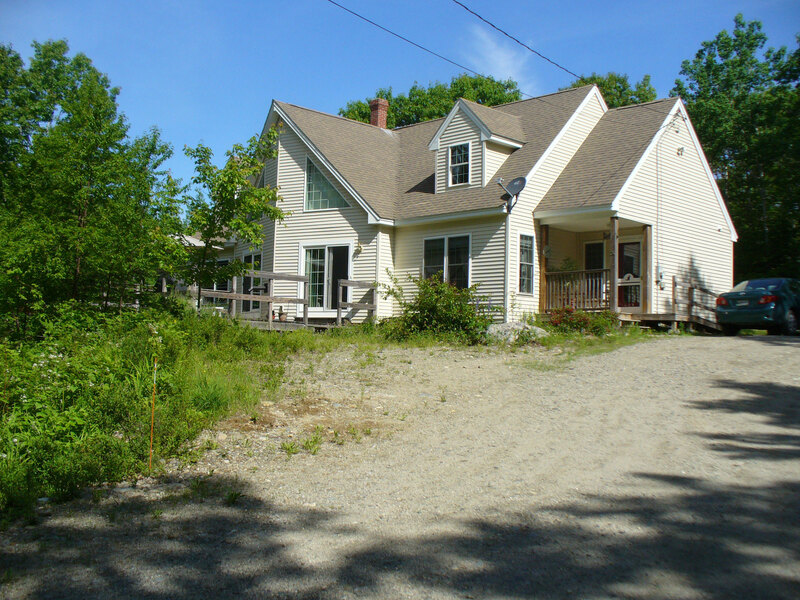 They live “away” so the party waited until they came to Maine on their summer vacation. Party was fun, food was good, you can see his mom worked hard on the theme! I love this shot of the cousins enjoying their visit together. And here is what they were watching – she did not mind the audience. These are the cherry trees that bloomed so nicely a few months ago. 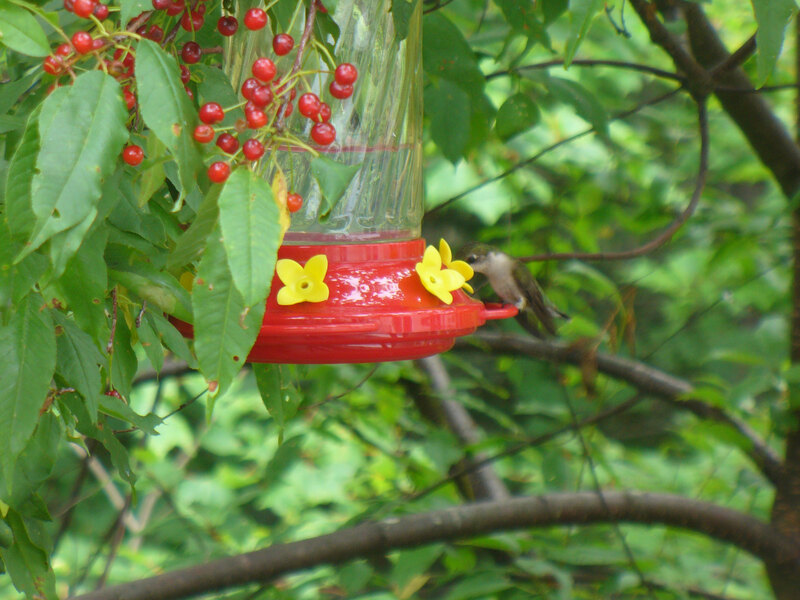 Birds, chipmunks, and squirrels will have them cleaned off in no time. 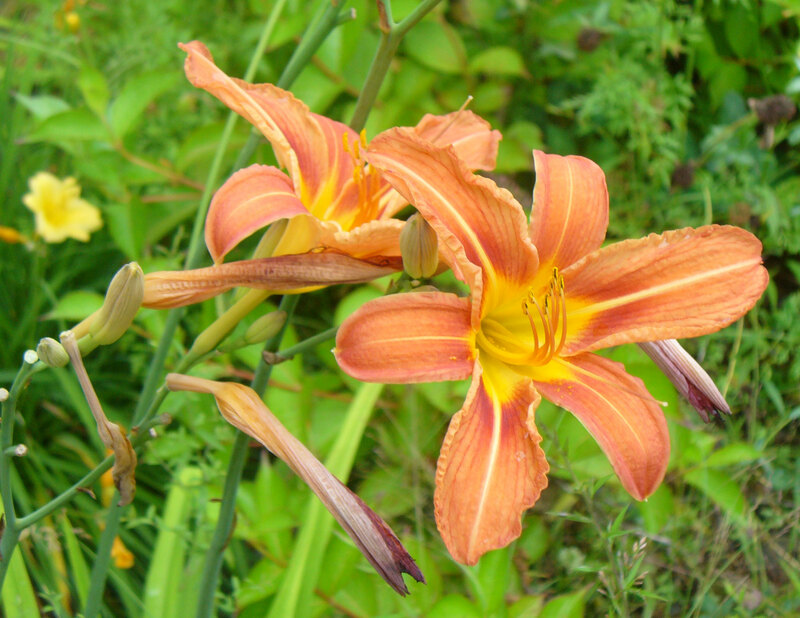 I just love daylilies, they are so bright and cheerful! Have a good weekend, I am going back to knitting…. Which reminds me – I finished these recently, wove the ends in yesterday. Summer colors ready for next winter. I’ll start with the finished objects. I am amazed at how many there really are! 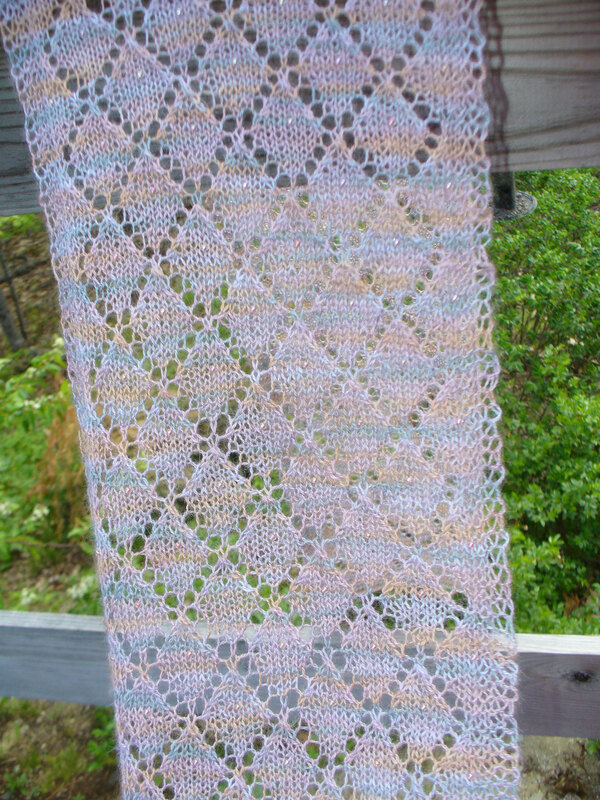 Two shawls – Leftie, just finished today – still on the needles here, as yet unblocked, but already well loved. 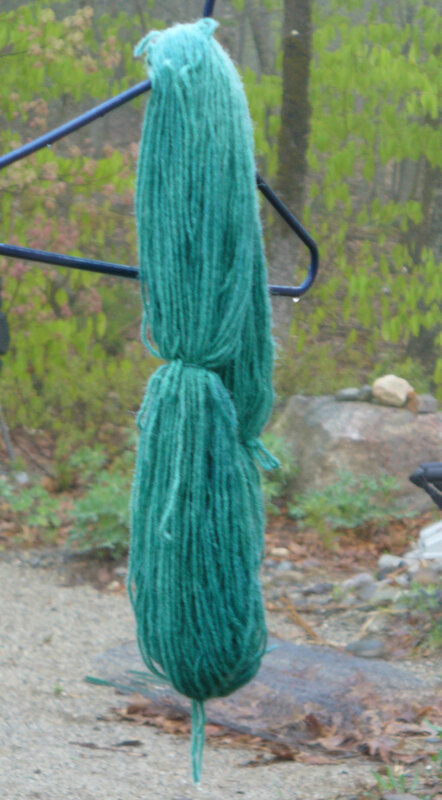 This is the yarn I dyed myself. 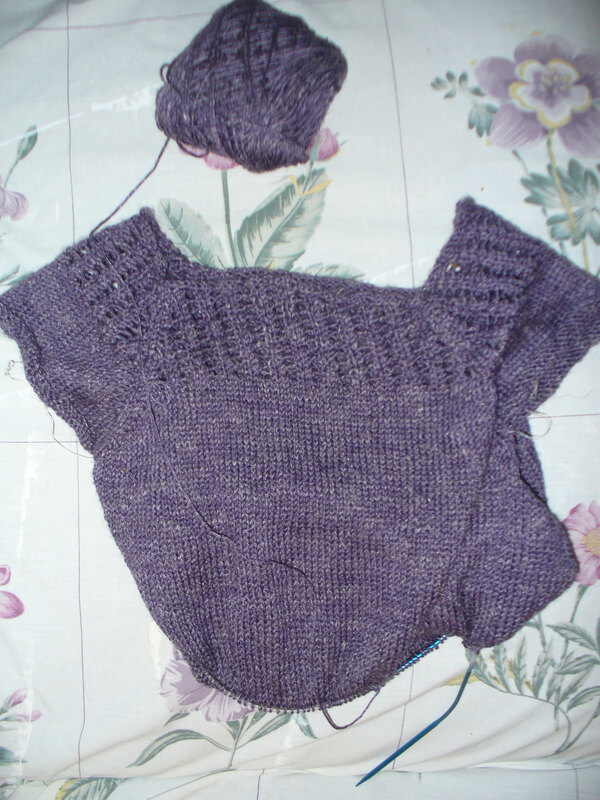 Lots left, I am thinking about a sweater…. 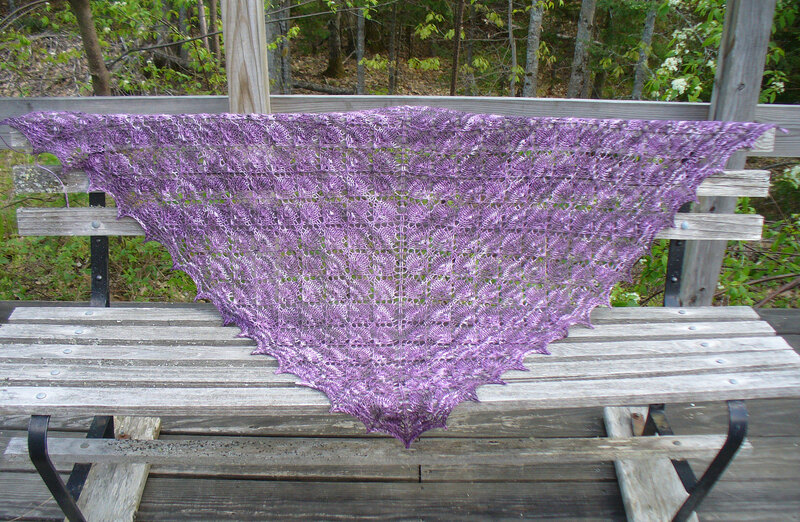 And Indian Feathers, which I finished a while ago, but just got photos of. 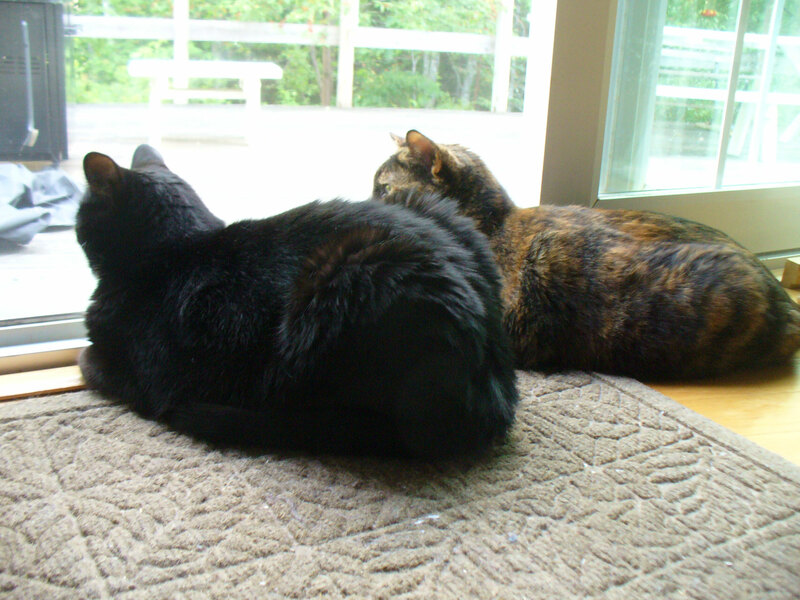 It is pouring rain, so they are inside shots. The close up is pretty accurate, color-wise. The beads are there, but as I mentioned before, too small for the pattern. Another Indian feathers – this one, 1/3 the size of the original. Also, larger beads, and more of them. Still unblocked, but I think it will be big enough to be a small cowl. I think I will wind up adding buttons to it. 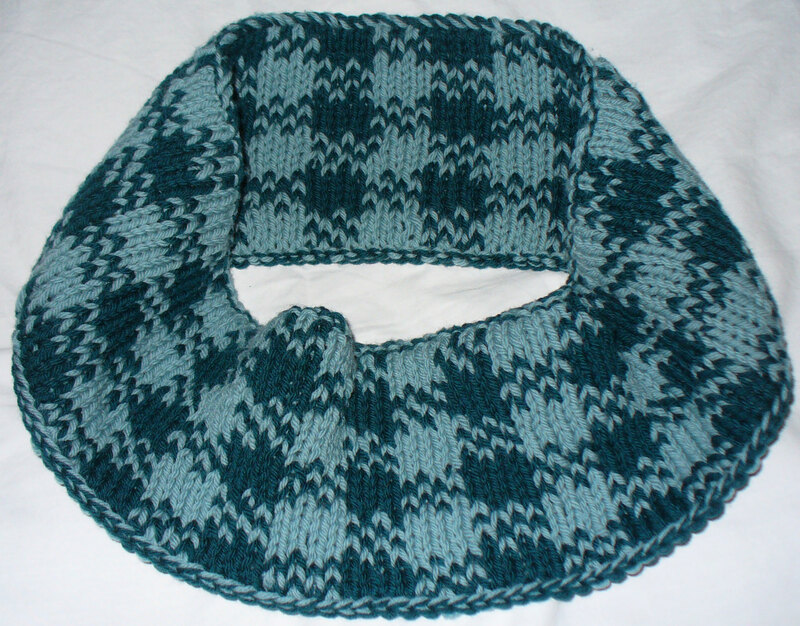 The trapper cowl – I am pleased with how it came out – very warm and cozy. I think it is a Christmas present, but I might keep it. Or just make another one…. That’s the lot of finished items – I’ll have socks done for you this week I think. And maybe cast on another shawl. Or a sweater. Or both? Who knows? 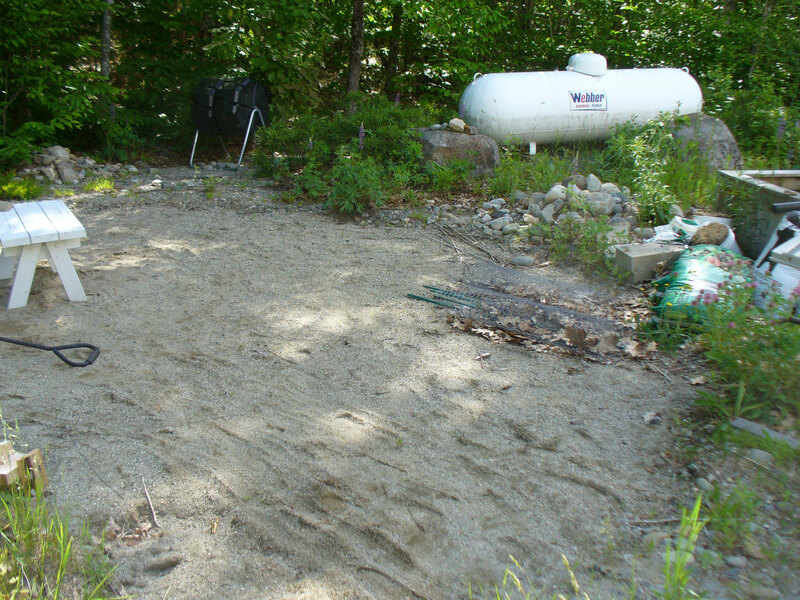 So, I need to clear a circle, 20 feet across, and make sure it has no rocks, is just sand. Here’s how I do that. 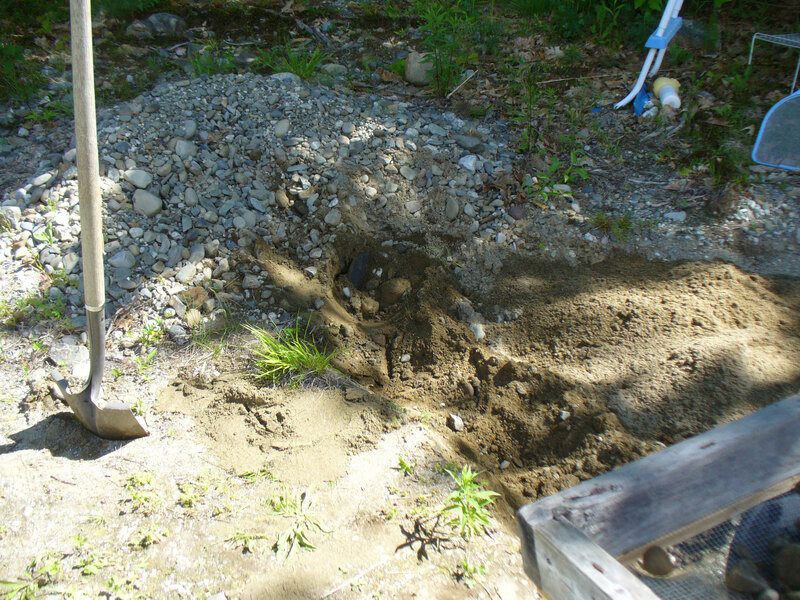 I dig down into the rocky sand about a shovel’s depth (which often takes several tries to get, because it is rocky!) 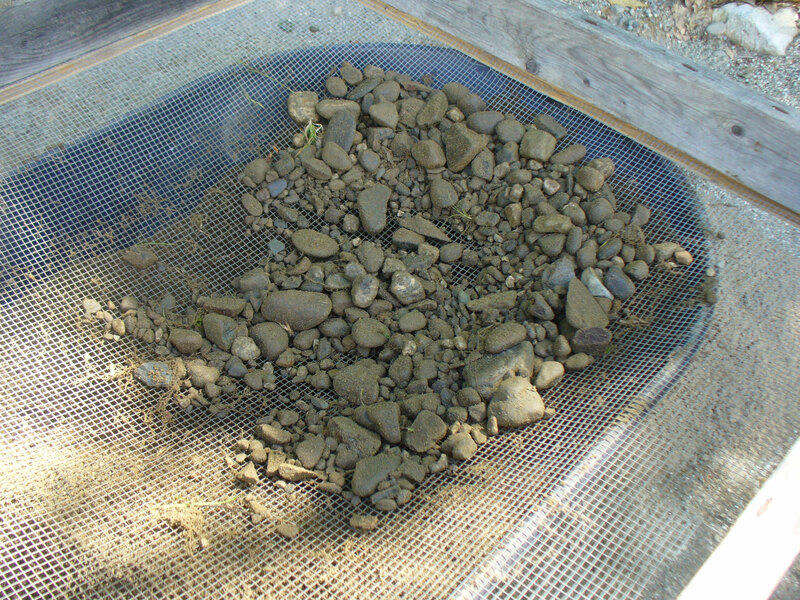 and put it into the sieve on the wheelbarrow. Then, using a rock (it took wearing out the fingers of several pairs of gloves to think of using a rock, not my hand) I sift the sand from the rocks. 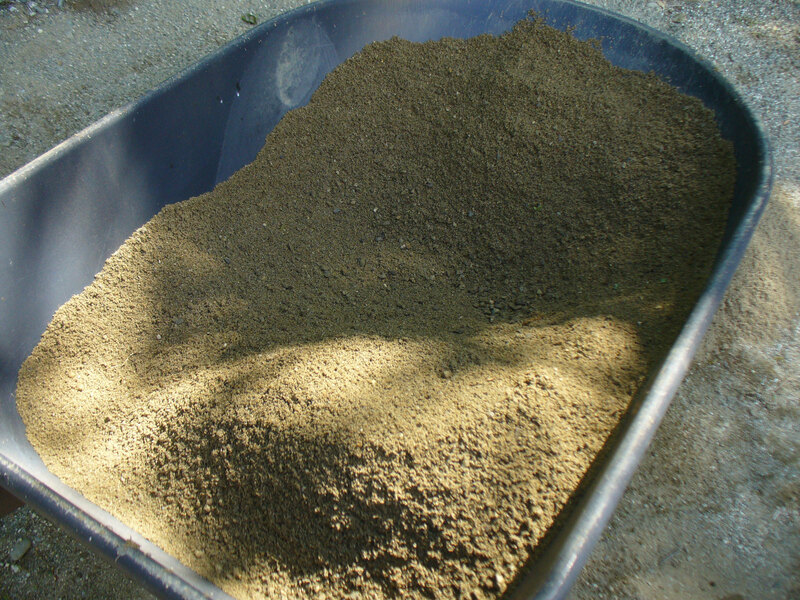 When I am done, I am left with a wheelbarrow full of sand and a sieve full of rocks. 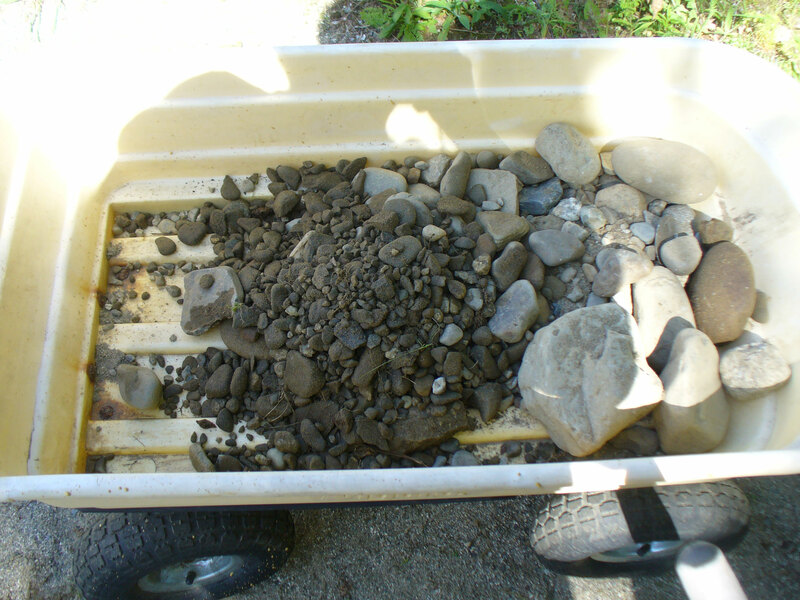 I dump the rocks in the other wagon, and the sand on the cleared ground, to later be spread and leveled. 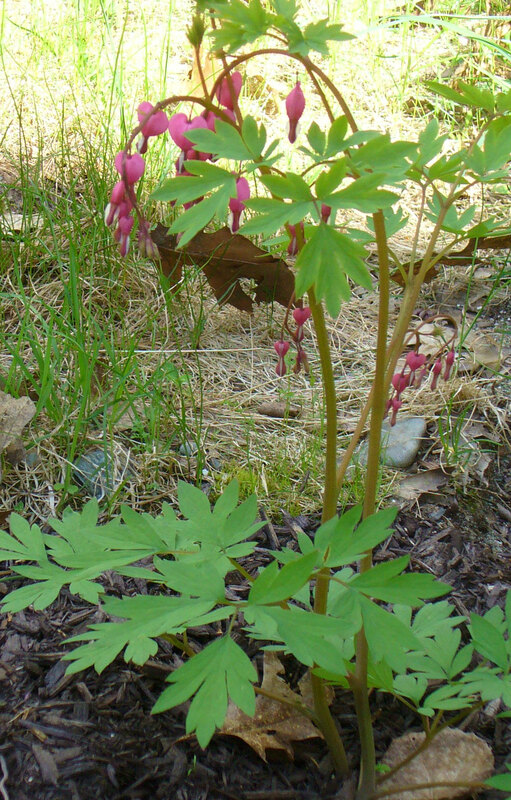 Then, I take the wagon of rocks over to the place where I am putting in the path. 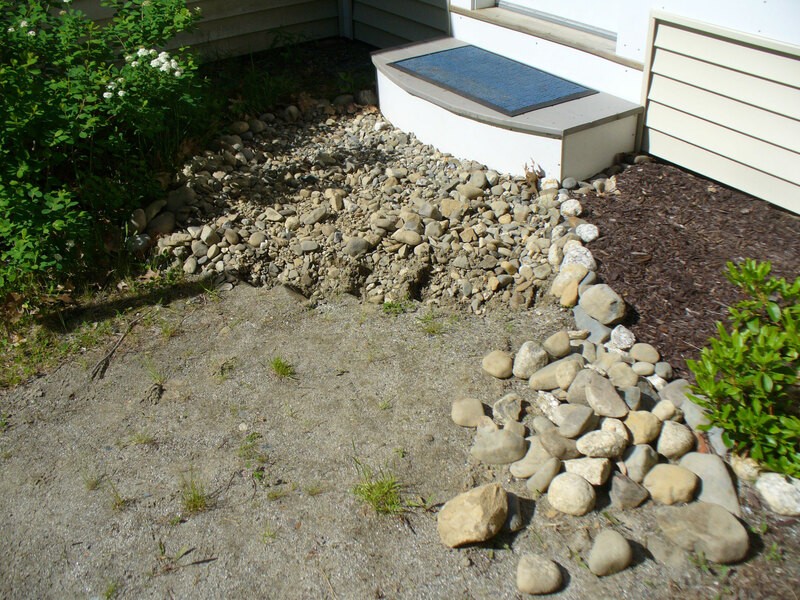 Dump them, shovel out some sand if need be (about every other load of rocks, I need to excavate some more sand, but it is easy digging – no rocks!) and take that back over to the pool area. 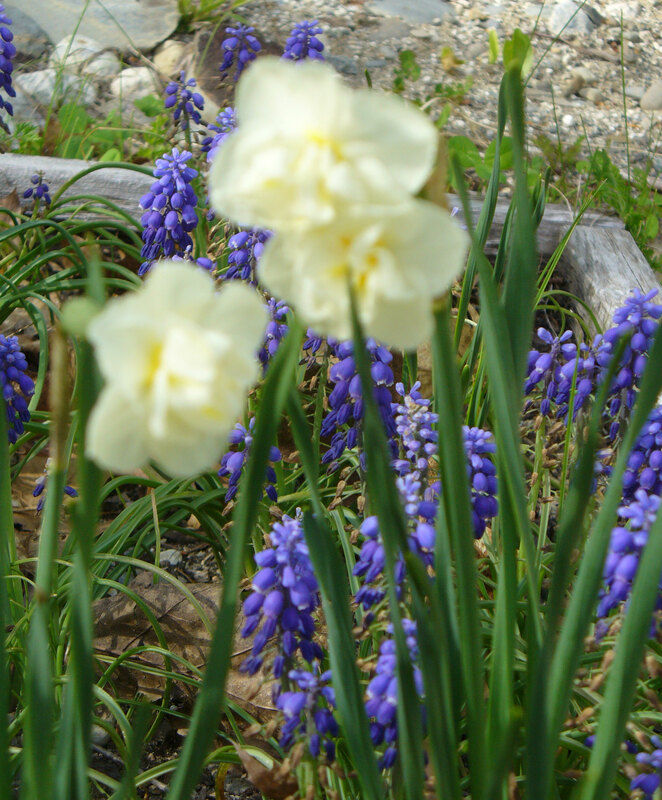 Here are some other shots of the crazy place I call a yard. 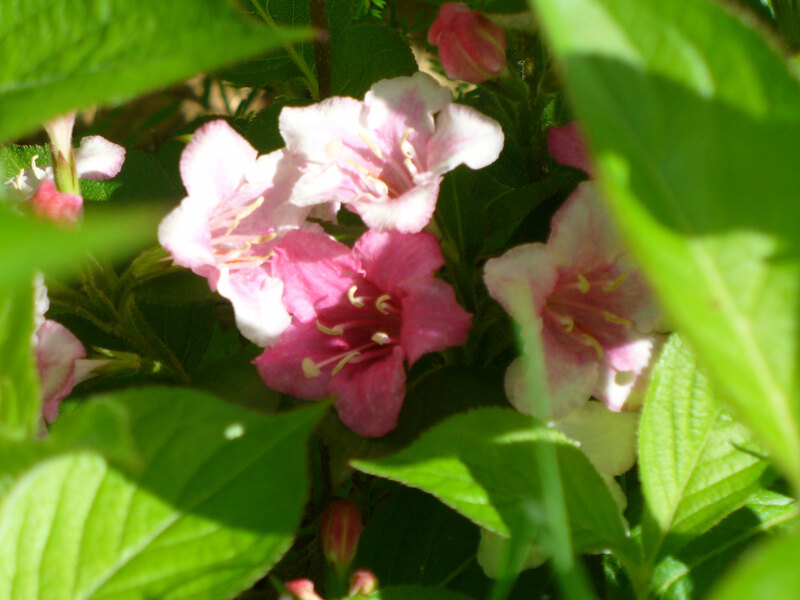 The wygelia is in bloom – it did not mind being under 5 feet of snow this winter! Well, perhaps it did – it is a funny shape this year. 🙂 But it is blooming like mad. 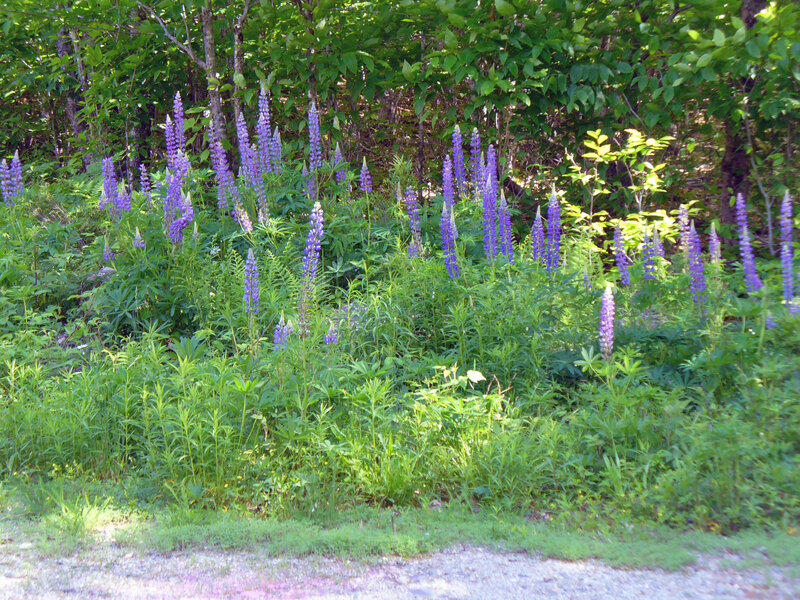 Here is the lupine by the driveway, spreading nicely to fill in the space between driveway and woods. 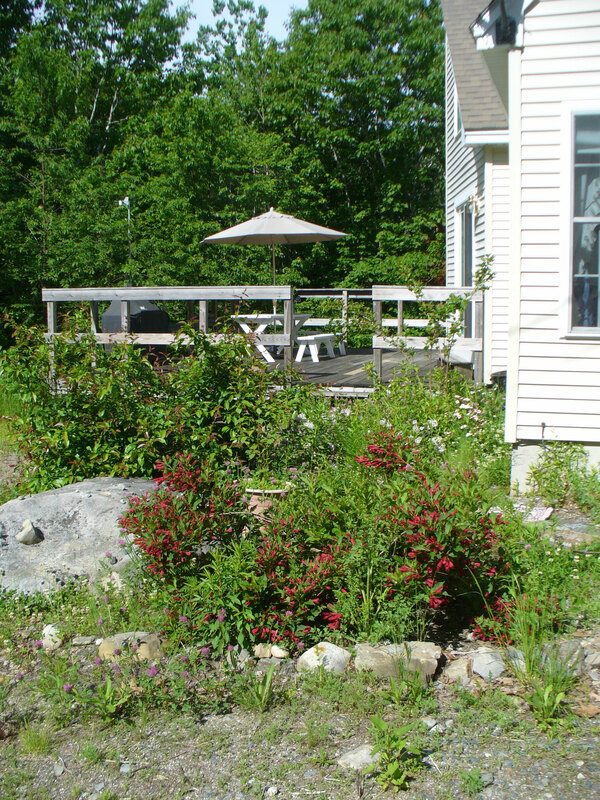 Here is a shot of that deck I love so much except in the midst of a snowy winter. 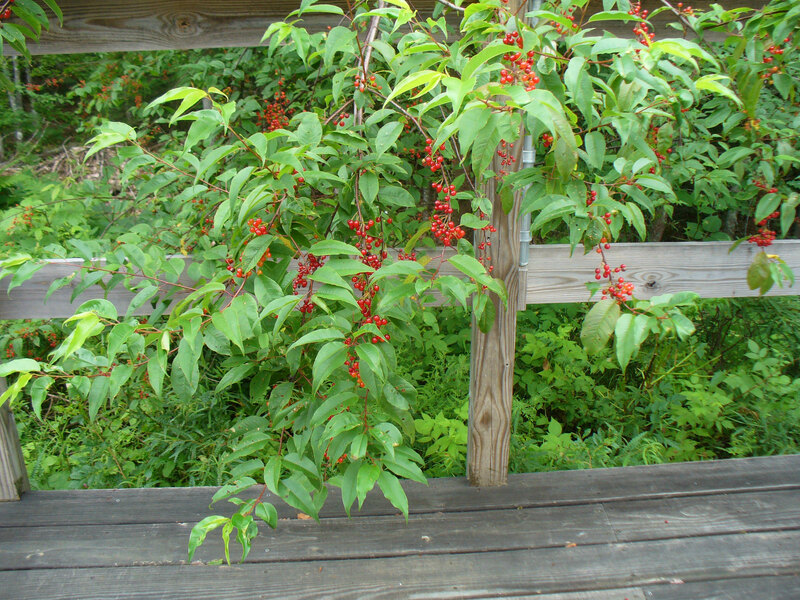 It is sunny all morning, then has increasing shade in the afternoon – a lovely spot to eat dinner. 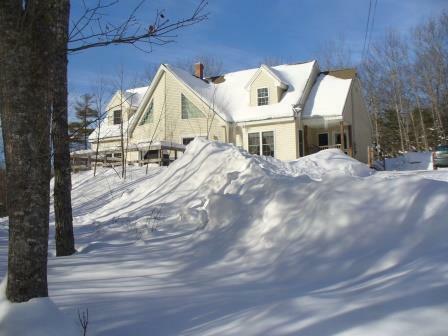 Speaking of winter – remember this shot? Yeah, I know, I try not to, too. 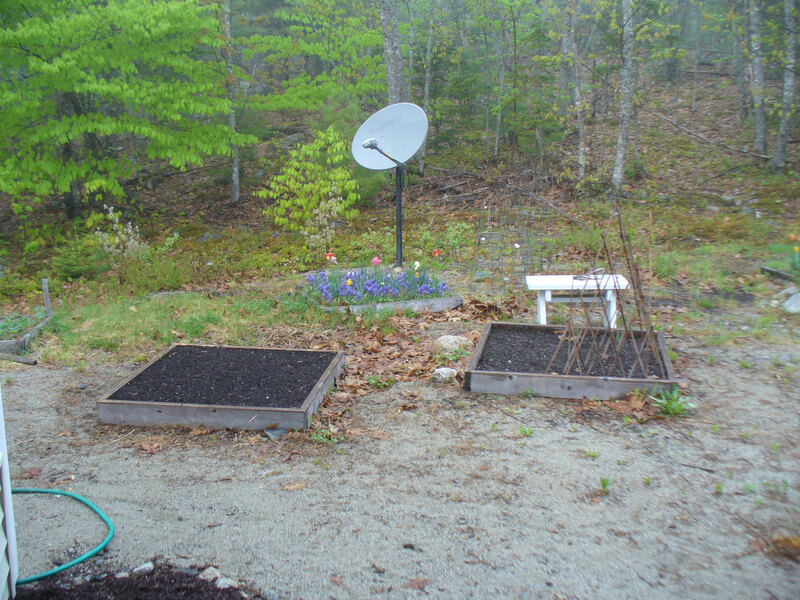 The raised beds are coming along – these photos are already a couple of weeks old, I forgot to take some yesterday. 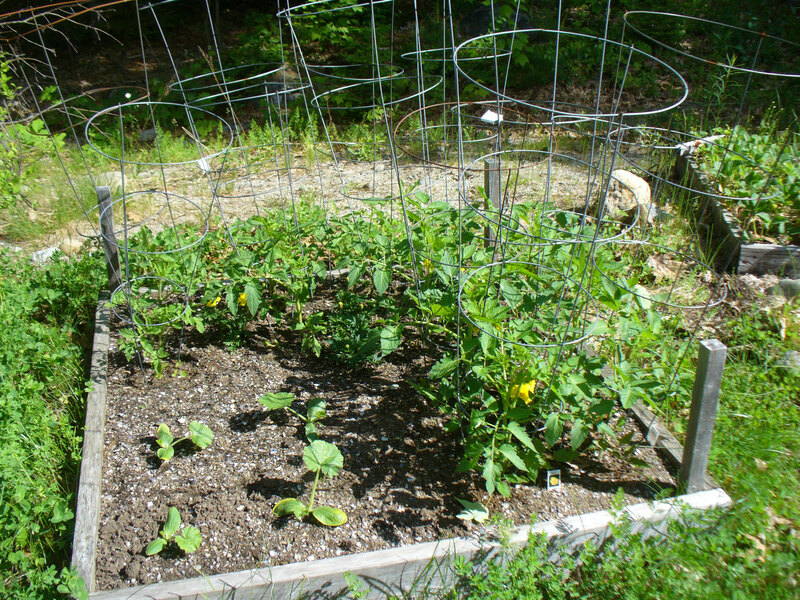 Tomatoes and yellow squash, with some marigolds. Tomatoes have blossoms on them now! 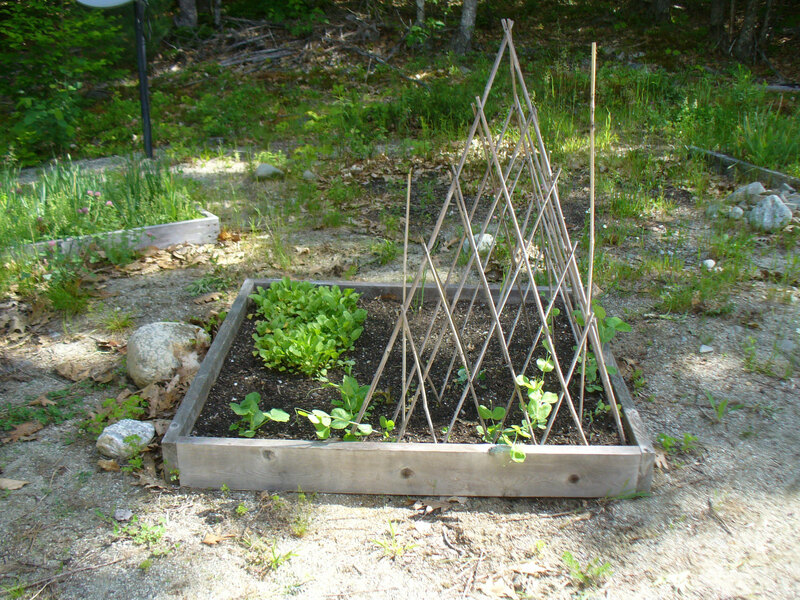 Radishes, carrots, peas, lettuce and pumpkins. 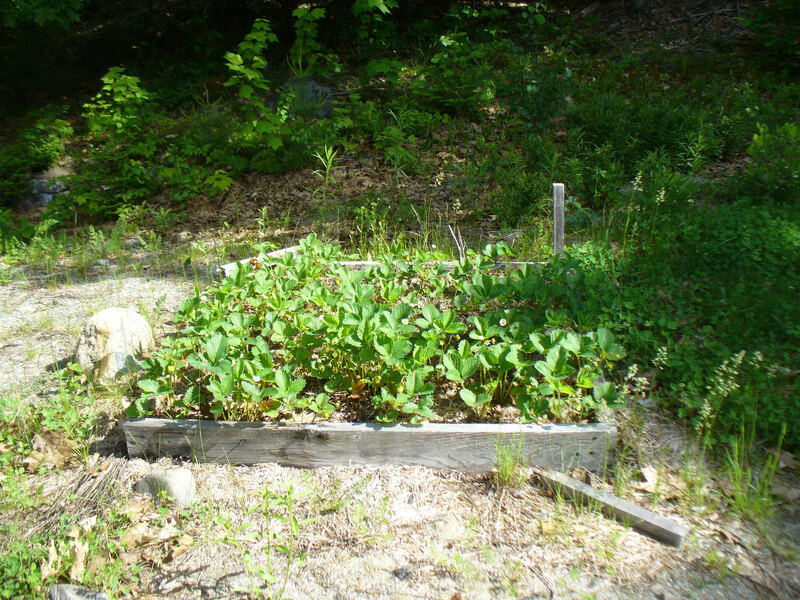 Radishes are up, but not getting round. Peas are up and looking ready to bud, but not growing tall because a deer keeps trimming them. Carrots are up, but not very well. I will likely reseed them when the radishes are done. Lettuce not up at all, I’ll reseed that as well. Pumpkins are up and growing. So that is it off the camera. It piles up quickly! Sister in law L’s son D and his wife A are back in the USA after two years in Madagascar. They will be around this week, and we will be so excited to see them, and get to know A better. I am hoping for good weather all week so I can continue to make progress on that sandy project, but if it rains, I can sit and spin and knit. And think about how happy I am this week with SCOTUS. And how pleased I am at how YOUNG my favorite justices are. They will be on that court for a long time to come. So that is what I am up to at this moment. All exciting, I know! 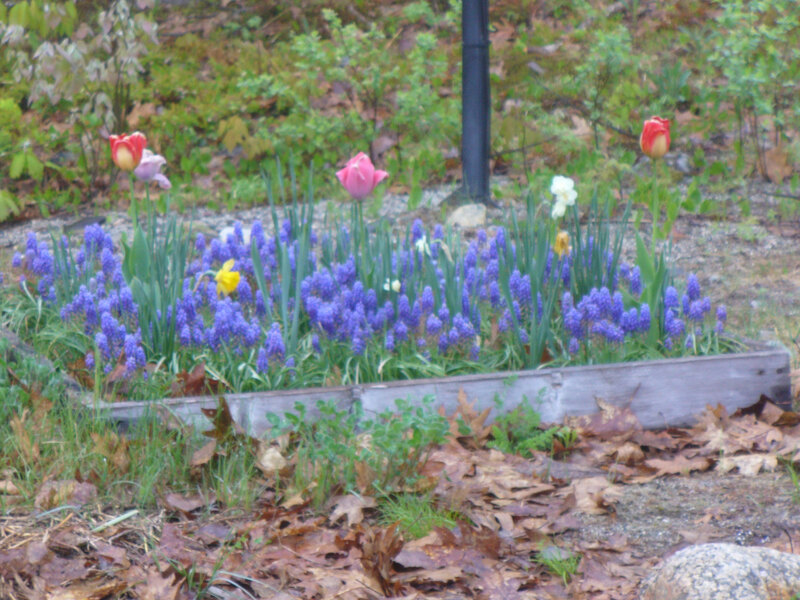 Some things in the garden are blooming – bulbs in their second year (sorry about the blurriness), and a bleeding heart transplanted from mom’s garden last fall. 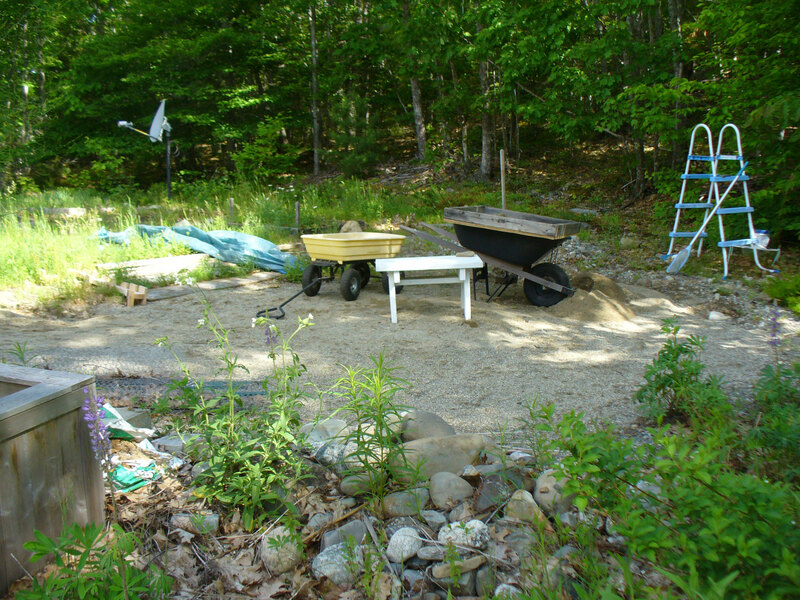 And in case you don’t believe me when I say we live on a complete pile of gravel in the woods, some of these photos will prove it. 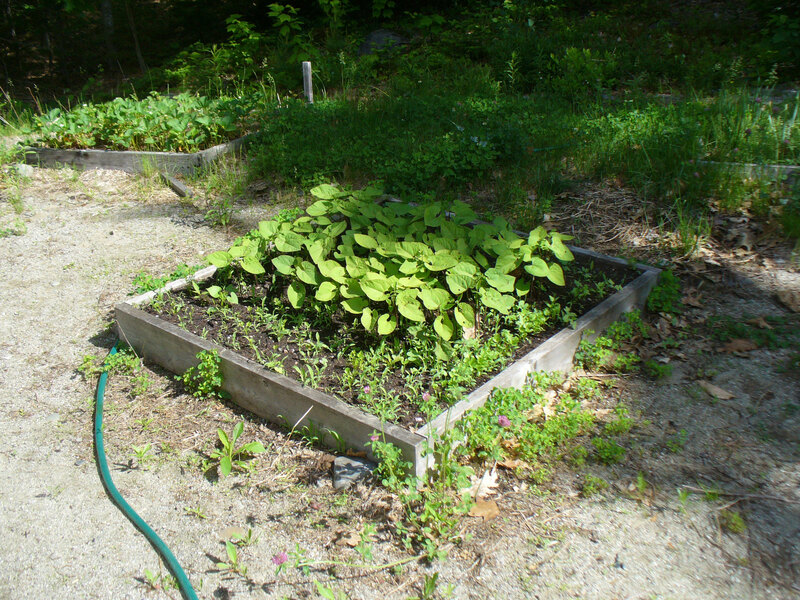 🙂 the raised beds are the ones L and I planted last weekend – my radishes and lettuce are already up! Mine is the bed on the right, L’s is on the left. I’ll post progress photos as the summer goes on. Here are a couple of shots of that gorgeous morning we had a few days ago. 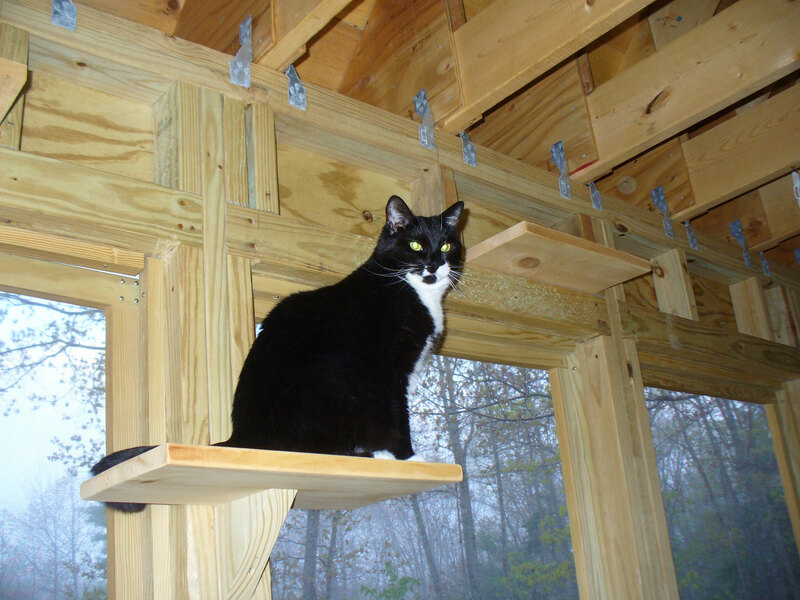 This is the same deck that was buried for months in snow – I sure like it better like this! 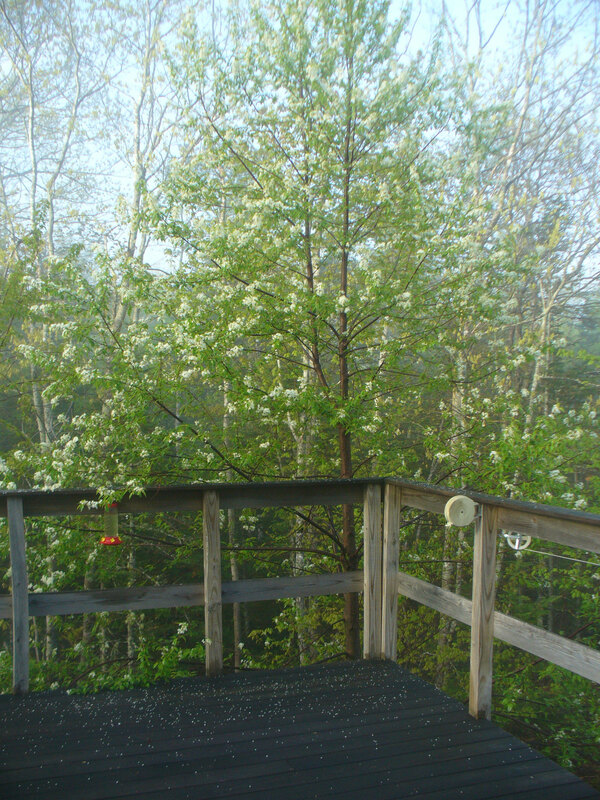 (And Kepanie, that is a cherry tree blooming beside the deck. 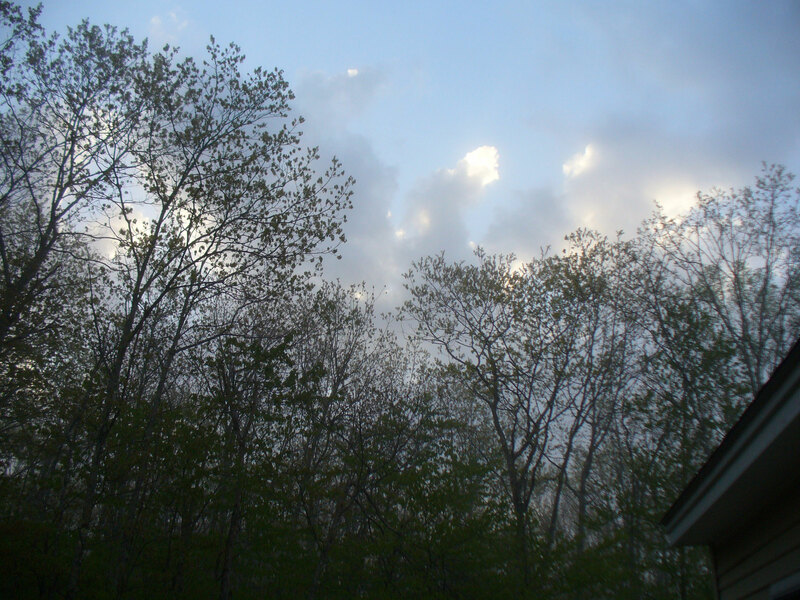 I will try to get some photos of the wild pear trees this weekend – they are almost gone by.) Isn’t that morning sky gorgeous? 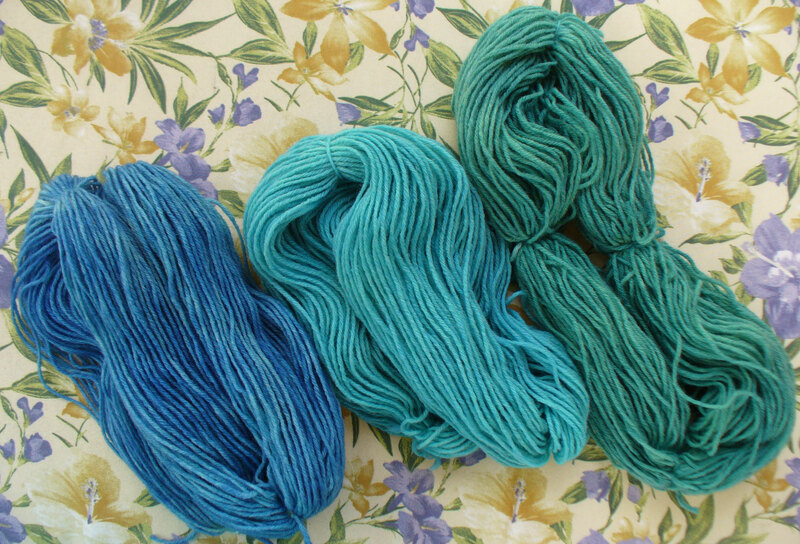 Yarn I dyed – three skeins of varying shades of teal/blue. Each is about 3 ounces. 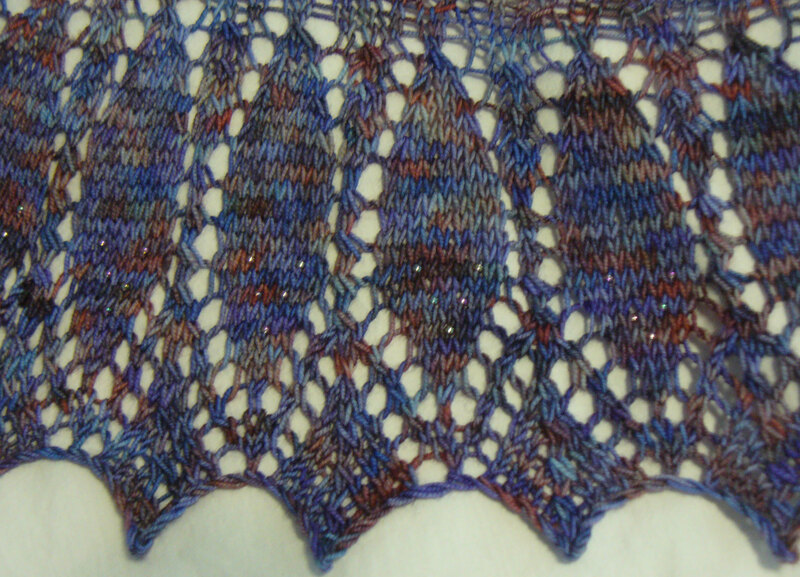 Not sure what they will be yet, but I have some ideas – maybe at long last, the leftie shawl? I let the teal “dry” outside, but it rained. Still, I think it looked beautiful in the mist. 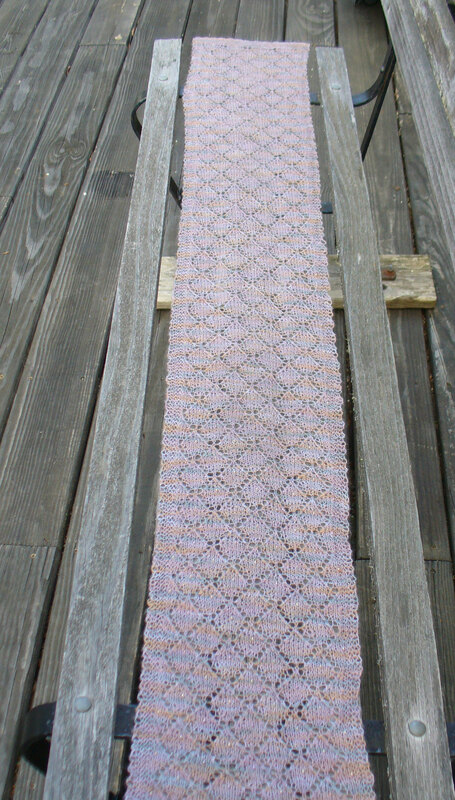 one of the endless scarves – this one needs to get mailed out this week, so I am glad I made it in time. You can just see the beads in this photo, but you can feel them in the weight of it. This is a silk alpaca blend, in colors that shift softly from terra-cotta to lavender – like a sunrise. I hope she likes it. 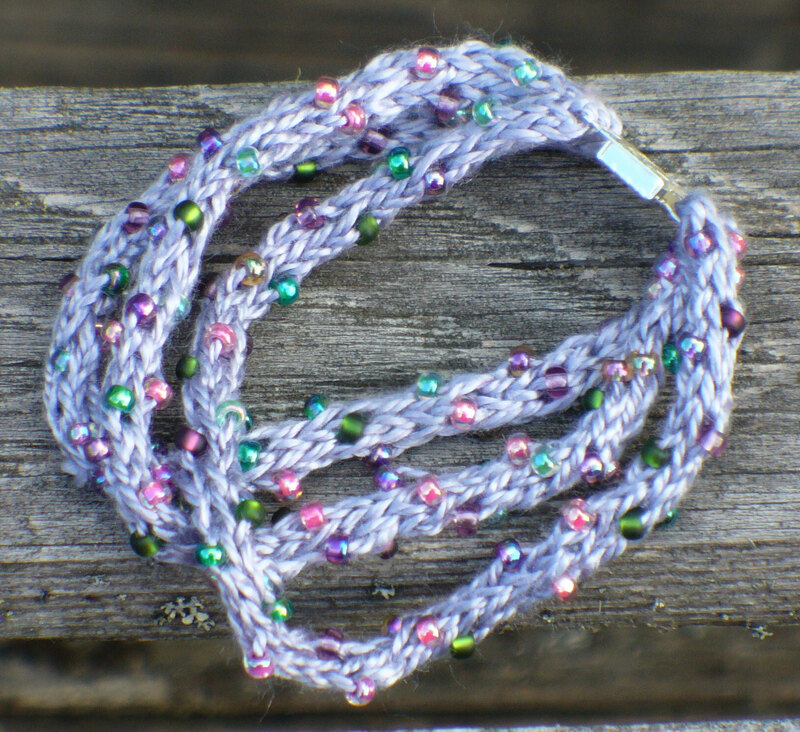 This is a little experiment that went well – silk and bead I cord bracelet. I am going to list it on Etsy later this weekend, so look for it! That’s all that is on the camera this week. I’ll clean it off for you again next week. This weekend is a holiday weekend, which we are both grateful for – an extra day off together is always good. Today we did a few chores in the morning, then went to Bangor to meet A’s family for lunch to celebrate sister-in-law S’s 65th birthday S’s daughter T, her husband J, son S, and daughter E joined us, as well as sister-in-law L. We had a nice lunch and got to visit with the “kids” both of whom have big graduations this year – S got his associates degree, and will continue at the University this fall headed for a bachelor’s degree in Accounting, and E finishes high school this year. She will head off to the local community college in the fall, working toward a nursing degree. Seems like they were just little kids a few minutes ago. 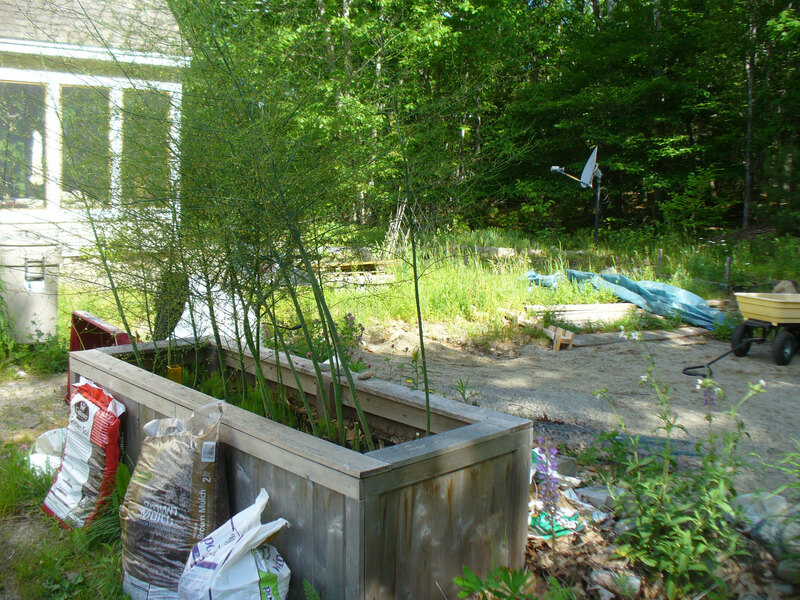 No plans at all for Monday, but much yard work to do!